There are busier (and wider) streets in Hunters Point, but Vernon Boulevard is the residential heart. 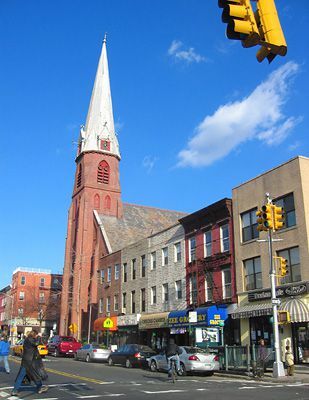 It's lined with restaurants, bars, and small shops from 51st Avenue north to about 47th Avenue. It turns increasingly industrial north of 47th Avenue. The NYC Marathon is a pretty good excuse to get up on a Sunday morning and party. The NYC Marathon crosses the Pulaski and winds its way through the streets of Hunters Point in Long Island City to the Queensboro Bridge and Manhattan. Long Island City is the 15 mile spot - a nowhere land in the middle of race where some friendly yelling is a real pick-up-my-legs-and-get-this-done for the runners. The route goes up Vernon Boulevard, past Gantry Park, and over on 44th Rd to 44th Dr to Crescent St/Queensboro Bridge. Spectators line Vernon cheering on the crowd and ducking into local bars for ahhh-ahhh cold beverages. One of the best spots on Vernon is Lounge 47. Decorated in vintage 70s style, it's hip enough, not too-cool-for-school, and not a sports bar. Lounge 47 serves one of Queens best burgers, and the outdoor garden seating makes it the ideal summer evening hang-out. Plus in November they open early for your marathon viewing enjoyment. This 6-story apartment building is a classic, probably built in the early 20th century. Behind it the 1980s Citibank Tower dominates the Long Island City skyline. Note the Filipino store on the first floor corner. The men outside have set up tables to play chess. After years atop the Pepsi bottling plant on the Queens waterfront, the landmark Pepsi sign has a new home adjacent to Gantry Plaza State Park. The Pepsi sign is perhaps more well-known to Manhattanites than folks in Queens. It faces out to the East River away from Long Island City. Beautiful red-brick brownstones line 45th Avenue in Hunters Point, between 21st and 23rd Streets. These 19th-century brownstones are now an historic district. In late 2004 a two-family brownstone sold for nearly $1 million. These appear to be the only brownstones in Long Island City. Two typical storefronts along Vernon Boulevard are a mix of old and new. The concrete window molding dates to at least the early 20th century. The air conditioners to keep the apartments cool are a little more recent additions. The Hackett Building, one of Long Island City's most distinctive and historic sites, was demolished in 2007 to be replaced by a condo. The Hackett Building, built circa 1885, was the seat of Queens County government from 1898 to 1916. Its triangular shape, reminiscent of Manhattan's Flatiron, is was neighborhood landmark, and its loss is a loss to the neighborhood's history. Talitha Whidbee who once ran Ten63 Cafe in the building, led the effort to get the Hackett Building officially landmarked before it was destroyed by condo developers.